Assault rifles have been at the forefront of home defense and sport shooting for years. 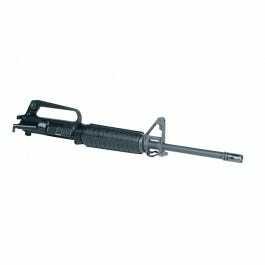 The AR, and in particular the AR-15, is an iconic firearm found in a variety of manufacturers and calibers. Part of the reason the AR is such a noticeable weapon is due to its look; a major characteristic of that image is from the AR barrel. Assault rifle owners want a personalized look for their firearm, and customizing the barrel can achieve this. However, we understand there are other reasons you might want to shop for a new AR barrel for your firearm. Accuracy is another major concern and a great reason to adjust the barrel you use on your assault rifle. The majority of AR barrels can be classified as either a chromoly steel make with a chrome-lined bore and chamber, or as a stainless steel make without the chrome-lined bore and chamber. Experts agree that the chrome-lined barrel has inferior long range accuracy. The distance at which it becomes an issue is debatable, but the stainless steel barrels are generally better from long range. If you are looking for a more durable barrel that is easier to clean and maintain, then the chrome-lined barrel would fit your needs. If you want to have multiple muzzle attachments, a threaded barrel would be ideal for you. There are plenty of options and reasons to change or upgrade your AR barrel. Whether you want to change your barrel for accuracy, want to make it have your unique look, or are just looking to replace a worn piece of equipment, GrabAGun.com’s extensive inventory will give you plenty of options to choose from when making your selection.